In addition to the regular #beersuggestioneers, this series features the palate and tasting experience of Chris O'Neal, beer geek a staff writer for the VCReporter, and Bec O'Neal, beer specialist for Whole Foods Market in Oxnard, CA. Learn more about these guest palates HERE. The dessert menu is always changing, but Heaven and Hell cake is on a regular rotation so if it isn't on the menu when you visit, you have another reason to come on back. Layers of devil's food cake and angel food cake with thick chocolaty mouse-like layers to hold it together are covered with a thick chocolate frosting. Chris preferred the Punkinweizen - WC's seasonal hefeweizen brewed with real pumpkin, brown sugar and pie spices. He appreciated the way the cake helped to neutralize the beer's sweetness and allowed the pumpkin spices to shine through. Jason's favorite beer pairing may seem a bit counterintuitive, too. He picked Desperado, an American IPA full of citrusy hops, as his favorite pairing for this dessert. He noted there was a slow, balanced transition between the cake (sweet) and the beer (bitter), and he also appreciated how the beer took on a herbal tea characteristic as it cleansed the palate. Bec's favorite beer pairing for this appetizer is Wolf Creek's Yellowstone Pale Ale. Yellowstone is a full bodied pale ale with a big citrus hop profile and a touch of caramel sweetness to balanced the finish. Bec appreciated how the Ale Mac 'N Cheese and the Yellowstone matched intensity -neither out covered up the other- and the malt flavors complemented the subtle smoky flavors in the bacon. Lastly, the beer's hop profile cleansed the palate leaving it refreshed for another bite of this rich appetizer. Chris' pick for this appetizer is the Timberwolf Bourbon-Oaked Red Ale. Timberwolf is a West Coast style red ale with a full body, lots of caramel malt flavors and balanced by a huge citrus hops profile. This particular version is also aged with Buffalo Trace Bourbon soaked oak. Chris liked the way the malt resonated with the bacon and cheese mixture and how the hop profile accentuated the the sharper cheese flavors. Jason picked Timberwolf, as well. His favorite aspect of the pairing was the way in which the mac and cheese resonated with the bourbon flavors and helped the bourbon's vanilla and hazelnut notes shine through. My favorite beer for this pairing is the Midnight Howl Black Ale. This is a hybrid beer that is best described as an IPA mixed with a stout. The beer's hop profile resonated with the gorgonzola accentuating the sharper notes of both. Also, the smoky nature of the beer resonated with the bacon accentuating that wonderful bacon aura we all love. Chris' favorite beer pairing for this appetizer is Wolf Creek's flagship IPA, Desperado. This American IPA is packed full of citrusy hops which is why Chris liked this pairing so much. He appreciated the way the hoppy citrus profile contrasted against the fried batter and seafood. Bec's favorite calamari beer pairing is a seasonal offering from Wolf Creek called the Punkinweizen. WC's Howln' Hefeweizen is the base beer but it is brewed with real pumpkin, brown sugar and pie spices. Bec appreciated how this appetizer helped to round out the beer and gave it a heavier body. The Punkinweizen was Jason pairing pick for this appetizer, too. He liked the way the beer's malt and yeast profile resonated with the sweetness of the batter which helped the subtle calamari flavor become more apparent. I picked Desperado as my favorite beer pairing for this appetizer because it is a fantastic example of a complex pairing. The malt profile of Desperado resonated with the batter and surprisingly, helped the calamari flavor pop while the hop profile helped to accentuate the black pepper spicing in the batter. What makes it complex is the citrus hop profile contrasted against the sweetness and along with the ABV helped to cleanse and refresh the palate. 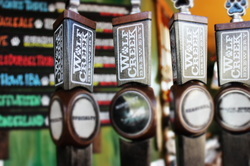 Every season (you know, winter, spring summer or fall type seasons) I write a beer and food pairing series featuring the Wolf Creek Brewery and menu items available at their restaurants. However, this series wouldn't be as rich and educational if it weren't for all "special guest palates" I bring with me to these pairing sessions. My guests and their palates broaden my flavor knowledge and vocabulary and help me discover new beer pairing options with each bite. This current Wolf Creek Pairing Series features Chris O'Neal a staff writer for the VCReporter and Bec O'Neal, a beer specialist for the Oxnard Whole Foods and my pints&pairings co-host Jason Hendrick. Click image for Instagram feed. Chris O'Neal is a staff writer for the VC Reporter who enjoys reporting on the gaming world and writes one of my favorite columns, 5 O'clock Somewhere. 5 O'clock Somewhere covers the the local (and sometimes international) drink scene. Can you believe 5 O'clock Somewhere is responsible for our friendship!? In fact, that is how we met. We got together to drink some beer and talk about beer geeky things and recorded the session for a VC Reporter podcast. Podcast can be located HERE. Bec O'Neal is a beer specialist for Whole Foods Market in Oxnard, CA. What does that mean? Well, she's the one you talk to if you are looking for just the right beer or if you need a beer pairing suggestion. Bec maybe 1/2 my age, but she has some serious beer knowledge. She started her beer career working as a beer educator for Brew Dog, she is a Certified Beer Server and she is the brains behind the blog The Hop Zealot, a beer guide to Ventura County.